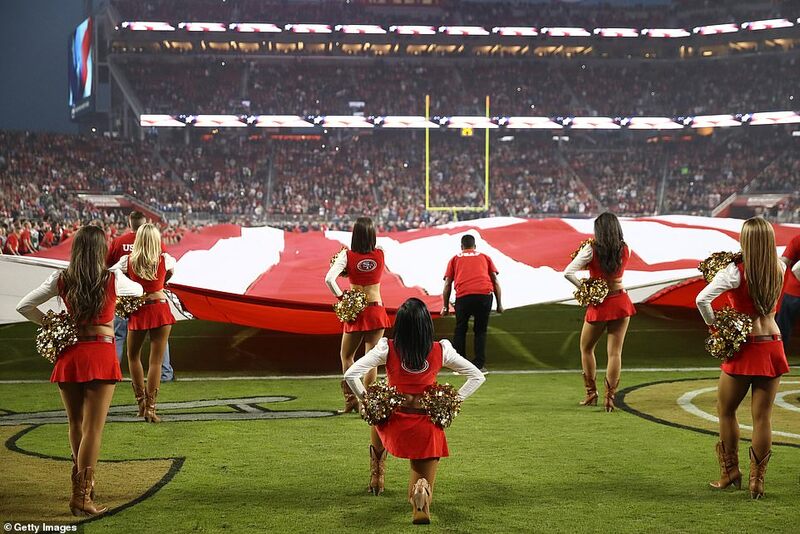 The San Francisco 49ers cheerleader who took a knee during the national anthem earlier this month, has protested once again during Monday night's Veterans Day football game. Kayla Morris, 24, took a knee for the second consecutive 49ers' game as San Francisco fell to the New York Giants 27-23. 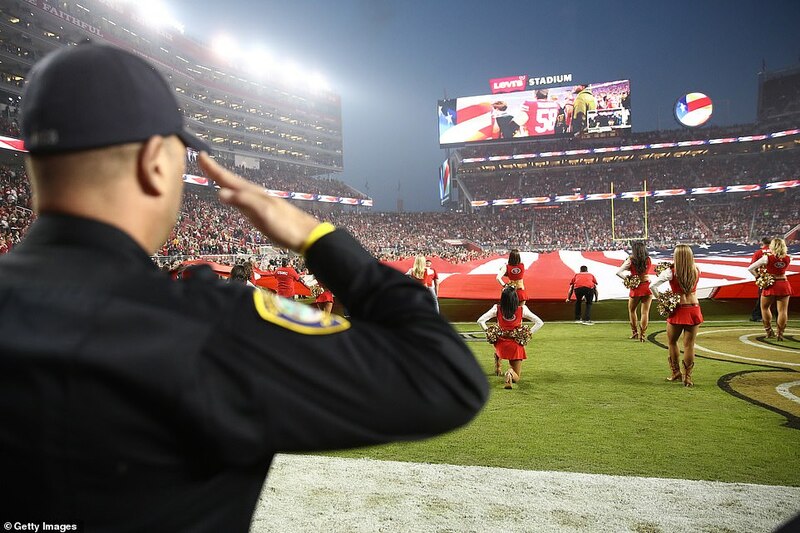 Morris stirred up controversy during the 49ers November 1 game against the Oakland Raiders by being one of the few NFL cheerleaders to follower former 49er Colin Kaepernicks' lead and take a knee during the playing of the national anthem. While some have supported the cheerleader's peaceful protest of racial injustice, others are deeming the act disrespectful as it came just one day after Veterans Day. Team coaches and staff wore Army green gear instead of their team colors to honor the men and women who served during this weekend's football games. Morris became a nationwide sensation after she was captured in a viral photo kneeling in the second row of cheerleaders during the home game vs the Oakland Raiders at Levi's Stadium. The photo had been liked tens of thousands of times on Twitter, and shows the brunette woman, from Antioch, California, taking a knee while the other ladies stand around her to honor the flag. 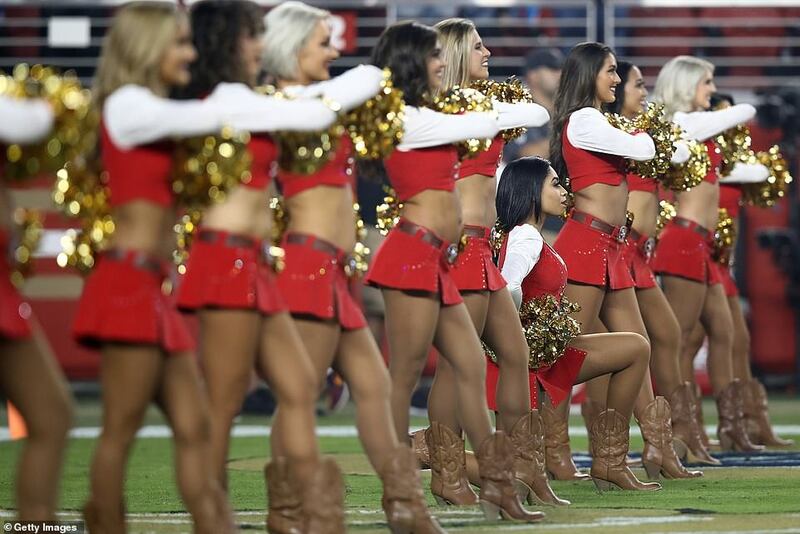 The official website for the 49ers states that Morris has been a member of the Gold Rush cheerleading team for two seasons. Morris' former teammate, Kayla Rossell, told DailyMail.com after her initial protest: 'I think it’s an extremely brave and courageous thing to do... and I think it’s been met with love and respect from both the Gold Rush director as well as the team itself, just based on my past experiences there. The NFL announced a fix in May that would have required players to either stand or stay in the locker room during the anthem, but that has been put on hold as the league and players' union negotiates a compromise. ESPN reported in September that a resolution is not expected this season. Throughout the last few seasons, the protest spread as more NFL players and some in other sports kneeled during the anthem. Kaepernick said the protest was sparked by the needless deaths of African Americans at the hands of police, which were also being highlighted by the Black Lives Matter movement that began in 2013. During a post-game interview on August 26, 2016, Kaepernick said: 'I am not going to stand up to show pride in a flag for a country that oppresses black people and people of color. On September 24, 2017, more than 200 players sat or knelt during the anthem in response to President Trump calling on owners to 'fire' players who took part. Kaepernick has not played in the NFL since 2016 and is currently fighting a collusion case against the league for blocking him out. The peaceful gesture has infuriated some conservatives, particularly Trump and Vice President Mike Pence who walked out of a NFL game in Indiana on October 8 2017, after several players refused to stand. Pence said he found their actions disrespectful to military veterans.